In the second volume of Jill Williamson’s Kinsman Chronicles, a remnant has escaped the destruction of the Five Realms and now lives on several hundred ships adrift at sea. As a flock, they sail north into the unknown in hopes of finding land that might become their new home. As the king’s illness worsens, Sâr Wilek takes authority over the expedition and struggles to rule the disjointed people, while assassination attempts, vicious serpents, and dark magic endanger his life. The plot. If you’ve read book one, the Armanian people are in complete disarray living on boats. Believe it or not, this really worked for all the points of views the author is juggling. I knew the characters couldn’t get far; they were limited by the seas. It didn’t feel like I had hands in too pots. I found myself just as anxious as the main characters in hoping they would find land, devastated when the didn’t, and frustrated by the antics of some people. In other words, I was really, really invested. Layers. This book is long. Long books are a good thing when the story is good and this story was good and filled with complex characters who are not just bad or good or from this side or that one. People change over time in this series. Sometimes that’s a good thing, sometimes it’s not. Characters. I loved Wilek. I loved Trevn. Both were characters I could trust as a reader, even when they made mistakes. And in spite of the fact that I read the first book ages ago, I found myself rarely lost in the company of these characters. Romance. This book is somehow not a romance novel and yet people get married. It’s not a slow burn because people get married quickly. But somehow it still managed to speak to my romantic heart and work for this book. Spiritually, the novel deals with the importance of obeying God, especially when it seems foolish to do so. It made me stop and think about my actions. There was one or two point of view I found myself skimming through. Not everyone was as interesting. That ending. It’s not that it was a bad ending (I just wasn’t sure how to categorize it). 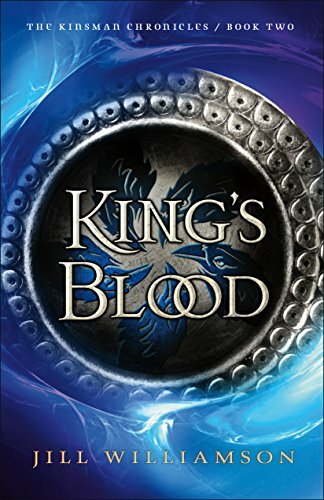 In fact, having read the Blood of Kings Trilogy which takes place some hundred years after this series, I was fairly certain what was going to happen. But it didn’t lessen the impact. Kudos to the author for making me care so much about these characters. But oh…how it hurt. Overall, an excellent sequel! Most authors drop the ball on sequels because they’re trying to extend a story that doesn’t need extension. Not this book. The second book is better than the first and I eagerly await the third.